She’s a little bit country — born in Nashville and being the daughter of Billy Ray Cyrus — and a little bit rock ‘n’ roll — check out that haircut. And Miley Cyrus is definitely one bride who will do things her way. Just in case she wants a little help, though, we’ve come up with some fab wedding ideas that let both sides of Miley’s personality shine. When you plan to wear something every single day for the rest of your life, you want to pick not only something you love but something that will pass the test of time. These rings for Miley Cyrus and Liam Hemsworth are beautiful and modern, like the bride, but have enough classic style that they won’t be passé in a few years. She may be an LA doll now, but at heart Miley is still a country girl — and she’s young enough to pull off this sweet-as-pie, super girlie wedding gown. She has the new short ‘do — why not show it off? 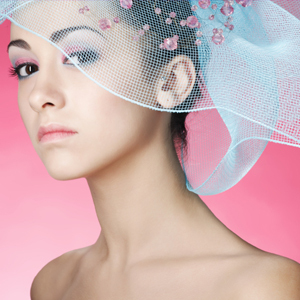 Don’t cover it up with a long veil. A birdcage fascinator gives Miley a rock ‘n’ roll edge to an otherwise traditional look. 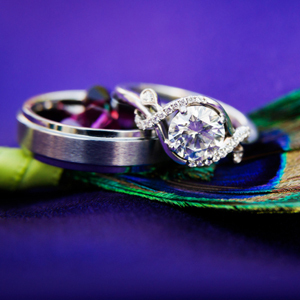 Miley’s favorite color is purple, and we’ve selected a sophisticated hue to carry through her entire special day. 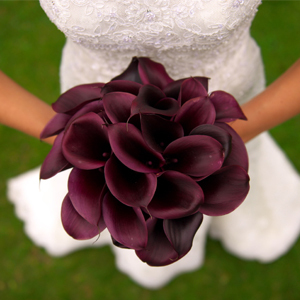 A bouquet of aubergine calla lilies will cut the saccharine effect of her frilly dress. 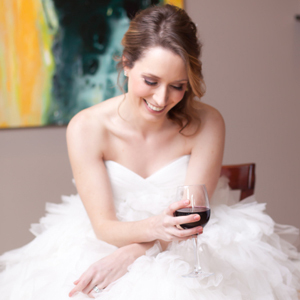 What better way to inject a dose of sass into your wedding day look than with colored shoes? These are in Miley’s favorite color, purple, and coordinate with her aubergine bouquet. The modern design gives them a rock ‘n’ roll flair. 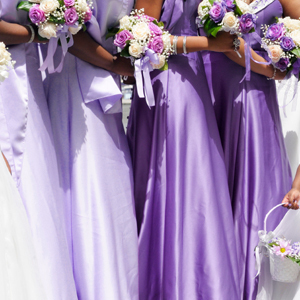 Miley could choose to put all her bridesmaids in the exact same gown, but when there are so many gorgeous dresses to choose from, and so many beautiful hues of purple, why choose just one? We think she should have her girls pick different styles in varying shades from eggplant to lavender to shake things up. 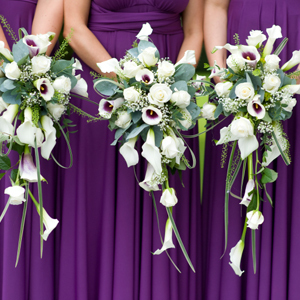 A nice complement to Miley’s aubergine bouquet, these cream calla lilies match the hue of the bride’s gown, and the dark purple centers call out her own bouquet. Oh yeah, there’s a groom. 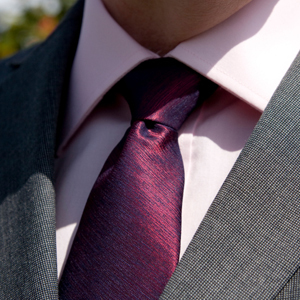 Liam Hemsworth can watch Miley walk down the aisle in a dapper dark gray suit with lavender shirt and dark purple tie. Miley can’t be tamed, and neither can these wild centerpieces. 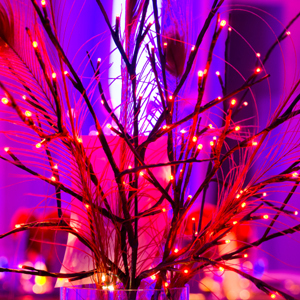 Peacock feathers and sparkly branches bring a touch of nature to the tables, and the hot-pink twinkle lights are total rocker chic. 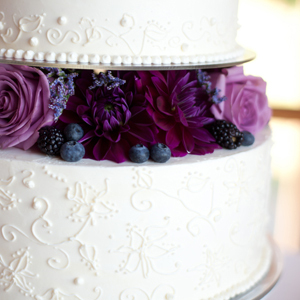 The layers of a traditional lacy white cake separated by dramatic plum-colored blooms bring together both sides of Miley’s personality: a little traditional, a little rocker, a lot Miley.